It’s been about six weeks now since Nimi joined our family. She has been an absolute delight and a fantastic addition to our household. She’s sweet, cuddly, affectionate, smart and devilishly determined to get her own way. 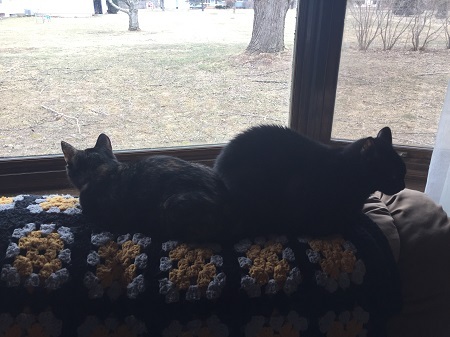 While not an alpha cat – she’s fine letting Ash keep that position – she’s got a definite youngest-child way of dealing with the world and the people/kitties around her. Unlike the other two cats, Nimi is fastidiously clean. She spends multiple hours a day bathing, and she likes to bathe everyone else as well. In the evening, she demands to put her face up to mine and bathe me. 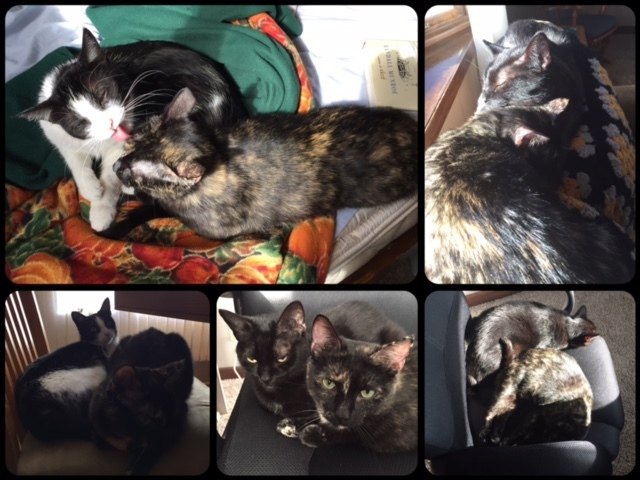 She does the same to the other cats, often holding them down so that she can bathe them. They reciprocate a tiny bit, but she’s intense when it comes to cleaning. She even stops purring when she gets serious about it. 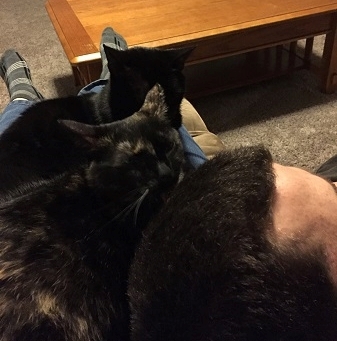 Once, she squeezed into a kitty pile (Jason’s head in my lap, Ash also on my lap, Nimi pushing in between them two of them) in order to bathe the back of Jason’s head. Ha! It’s not just during bath-time, either. She uses her tongue as a weapon. For example, I was once playing with Ash with the laser pointer. Nimi has no interested in said pointer, and Ash loves it. Just to see what would happen, I put the light on Nimi’s side while she wasn’t paying attention. Ash was distressed. He started whining and his tail got puffy, because that red dot was attacking his sister! She turned to look at him, noticed he was in a pre-pounce position, and immediately sprang into her own pounce. She bounded over and jumped on top of Ash, and proceeded to furiously lick his head all over. Nimi is also a sneaky sneak. I mentioned she was smart. It didn’t take her long to figure out the bedtime rituals. In the evening, when it’s time for me to sleep, Jason tucks me in, kicks the kitties out, and closes my door. Nimi does not like to be kicked out. She would prefer to spend the night in my room. Unfortunately, due to insomnia and other concerns, that’s simply not possible. Doesn’t stop her from trying, though. When it’s nearly time for me to sleep, she crawls under my dresser, or hides behind the armchair, or sneaks into the bathroom shadows. Normally, Jason finds her, but this past Saturday, he didn’t. He thought she’d left on her own. Instead, she hid for a couple hours – yes, hours – then came out and jumped up to cuddle against my face in purring triumph. She was quite offended when grouchy, woken-up mom deposited her outside the bedroom. 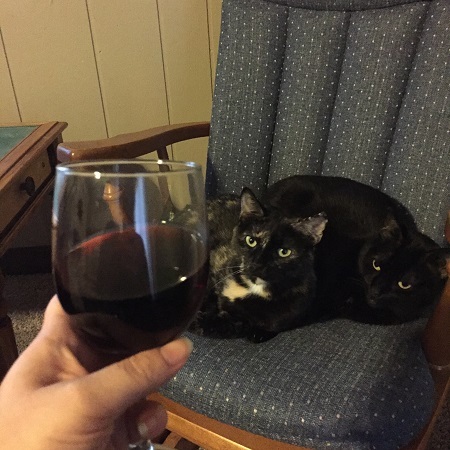 And because I have no pics of this, here’s another kitty-pile pic, as the cats followed my wine glass with interest, ha! Aw! She sounds like a very adorable and affectionate handful! That is a perfect description. 😀 Last night she woke us up at 5:30 by making her mewing sound like a dog barking. This makes me think she must have previously lived with a dog. Clever girl.